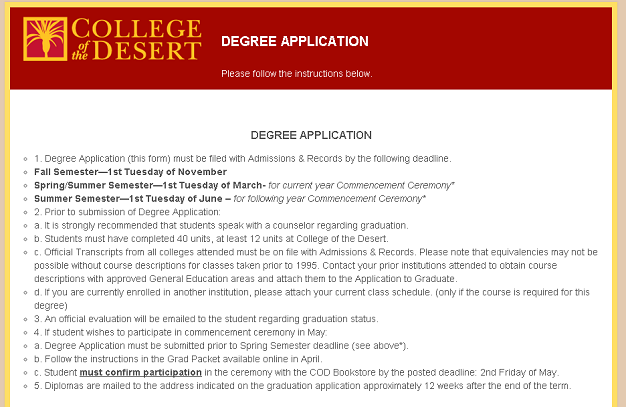 With more than 10,000 enrolled students, the College of the Desert’s financial aid and admissions and records departments process a large number of applications and petitions. Here is how these two departments have improved processing time by 40% with Laserfiche Forms. 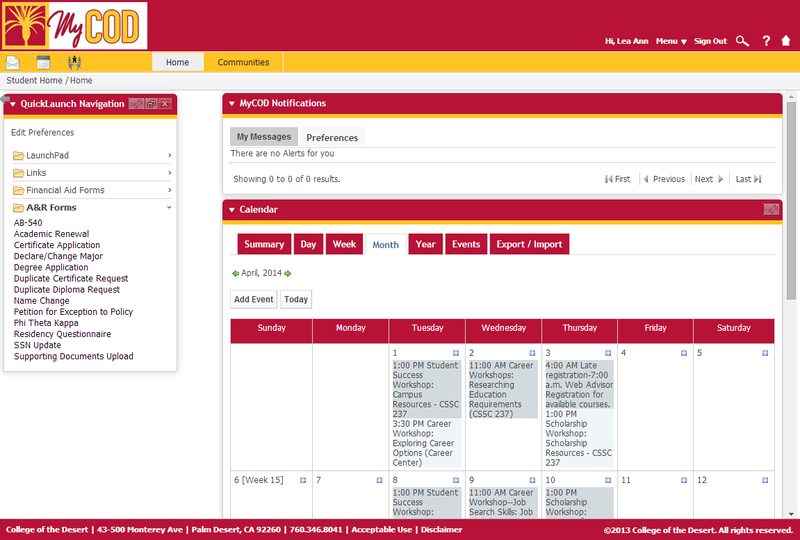 Once a student is logged into the online student portal, she is able to access all the forms offered by the college. The student selects the form she would like to fill out from the list. 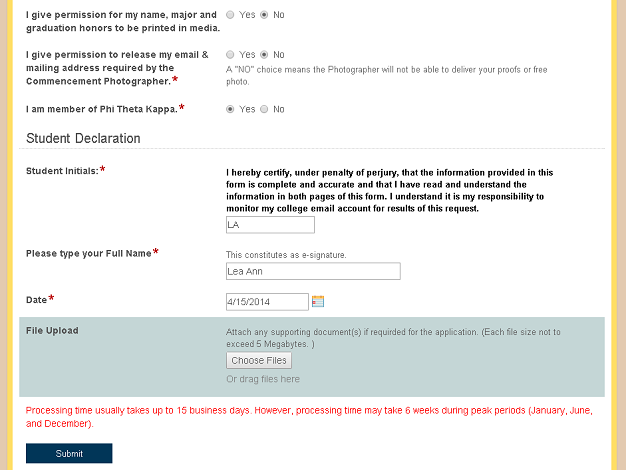 In this case, she will select the Degree Application form, which will be opened in Laserfiche Forms. The student fills out the form and submits it. 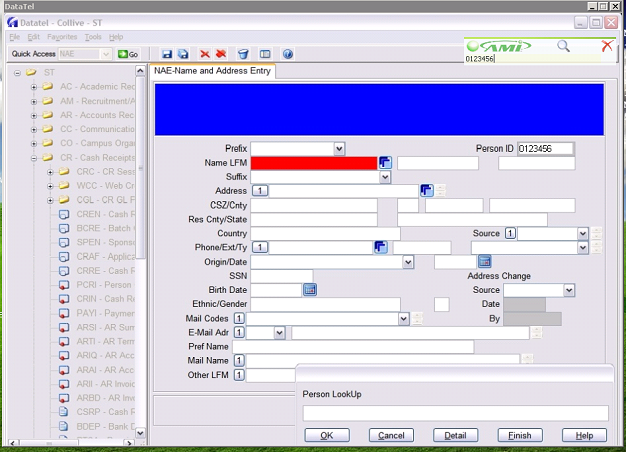 Field constraints prevent the student from populating incorrect data. For example, the student ID number must be seven digits long. 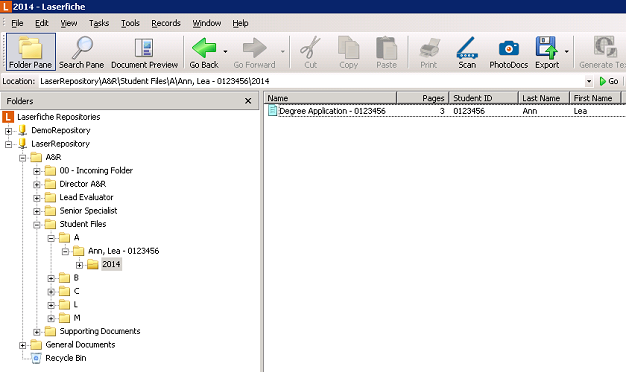 Once submitted, Laserfiche Forms saves a copy of the application in the student’s folder in Laserfiche. 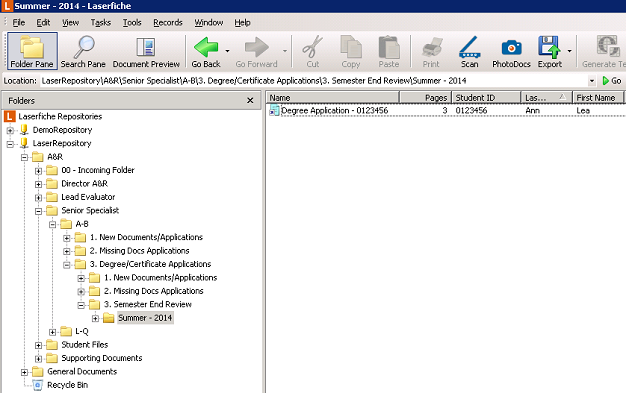 Laserfiche Workflow creates a shortcut to the application in the Senior Specialist’s New Applications folder. The Senior Specialist opens the new application and reviews it. As part of the review process, the Senior Specialist needs to look over supplementary information such as transcripts. 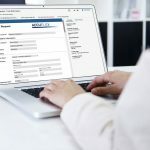 To make this easy for the reviewer, Laserfiche Workflow links each new application with a folder containing related supplemental documents as soon as new applications enter the Laserfiche repository. The Senior Specialist can open the folder of supplemental materials directly from the Links tab in the metadata pane. The Senior Specialist reviews everything and approves the application by changing the value of the Specialist’s Decision field. This action sends the application to the Lead Evaluator for final review. Laserfiche Workflow deletes the shortcut from the Senior Specialist’s folder and creates a new shortcut in the Lead Evaluator’s folder. The Lead Evaluator opens the application and views the transcript. He determines that the student is enrolled in classes currently and must pass them before she can apply for a degree. The Lead Evaluator makes a note of this using the Text Box annotation and sends it back to the Senior Specialist, who will review the application at the end of the semester. 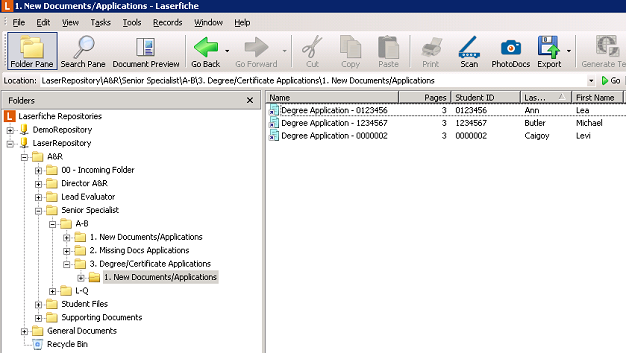 This action prompts Laserfiche Workflow to delete the shortcut from the Lead Evaluator’s folder and create a new one in the Senior Specialist’s New Applications folder. The Senior Specialist opens the application and views the Lead Evaluator’s note. 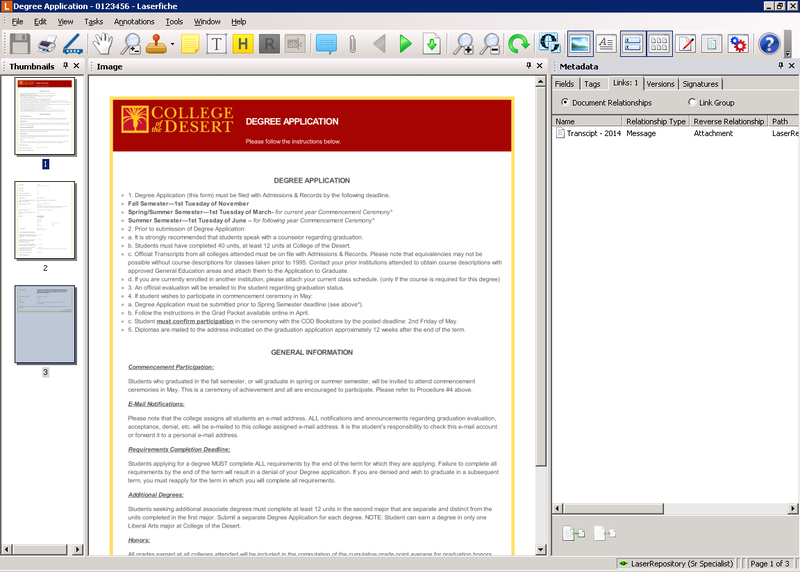 She changes the value of the Specialist’s Decision field to Semester End Review, which tells Laserfiche Workflow to move the application shortcut to the appropriate folder for later review. At the end of the semester, the Senior Specialist opens the application again, reviews it, approves it and sends it back to the Lead Evaluator. The Lead Evaluator also opens the application and approves or denies it. 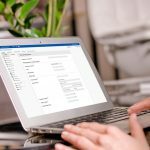 The student is notified of the decision by email and the application is stored in the student’s file. 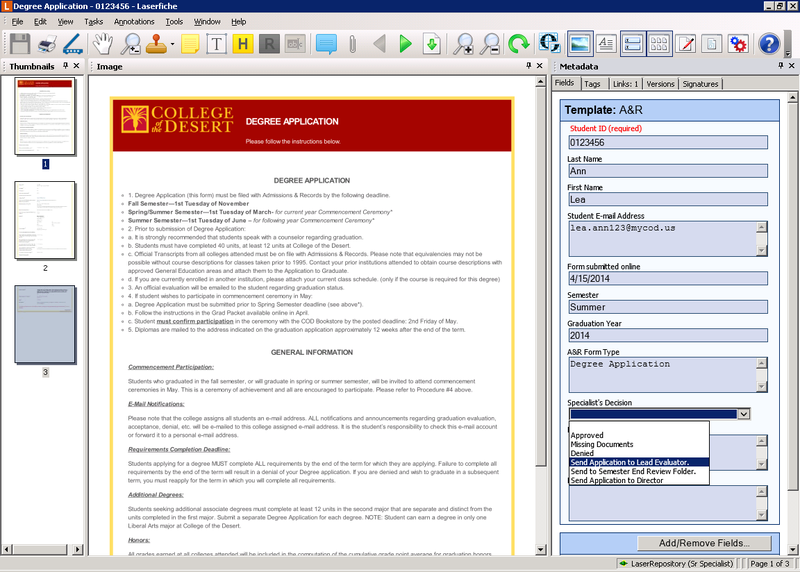 Laserfiche has been integrated with the college’s Ellucian Colleague Student Information System. All student documents are available at the click of a button directly from within the student’s record in Ellucian Colleague. This integration allows users to view everything from one system and prevents them from having to switch between software applications. 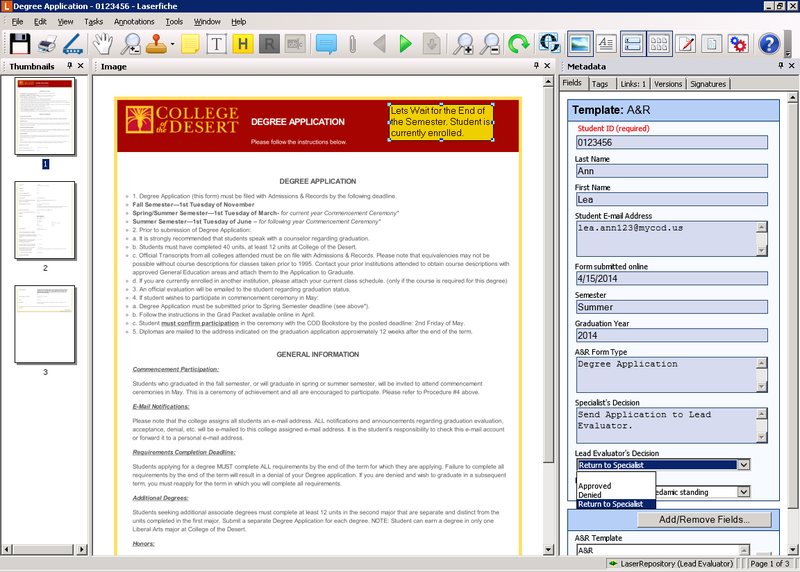 If the student outlined above inquires about the status of her application, the admissions employee can simply open Ellucian Colleague, find the student by ID and view all of the student’s applications without having to open Laserfiche. Application and petition processing time has improved by 40%. The student worker who used to spend all of his time scanning forms has been delegated other tasks. All documents are named consistently, which makes them much easier to find when needed. 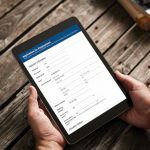 Students prefer to fill out applications online resulting in shorter lines at financial aid and admissions/records windows. Phone calls and inquiries to the financial aid and admissions/records departments have been significantly reduced since students are now notified about the status of their application as it moves through all stages of the approval process.